The second of three ‘Recognising Achievement’ receptions has been held in Swansea, and saw a range of people commended for the contribution they make to the lives of others. Those recognised during the day included individuals who have promoted equality, tolerance and inclusion, and have tackled all kinds of issues such as harassment, racism and domestic violence. The theme for the awards in 2010 is ‘Promoting Tolerance,’ chosen in part because it marks the 65th anniversary of the liberation of Auschwitz and the end of WWII. 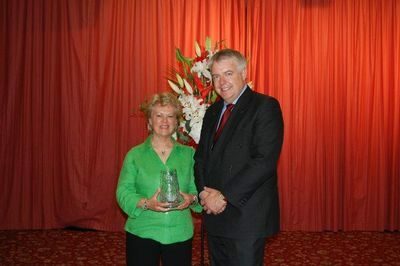 Pam Evans, Founder of Peace Mala, was presented with the award for the work of Peace Mala in schools and youth groups throughout Wales. Peace Mala is an award winning project for peace that Pam began in 2001, in response to the racial and religious bullying of pupils in her school that came out of the 9/11 aftermath. “Today is Wales’ chance to say thank you on behalf of those who have benefited from the actions of our recipients, many of whom have shown immense courage in changing attitudes and in standing up for what decent people believe to be the right course of action. “Wales is blessed, in its culture, its language, its heritage, its diversity, its love of sport and in so many other ways. But, above all, it is the people that make Wales a particularly blessed nation.